As a comedy of manners, The Party is British to its core—and not just because one of its many betrayals, big and small, involves a character going to a private doctor instead of using the National Health Service. Its characters are all so impeccably civilized, so incurably uptight, that their way of dealing with earth-shattering revelations is to engage in a philosophical debate about the ontology of love, or death, or God, or whatever said life-altering circumstance might be. That works wonders for driving the dialogue in this almost entirely dialogue-driven film, but isn’t as successful in terms of bringing drama to the proceedings. 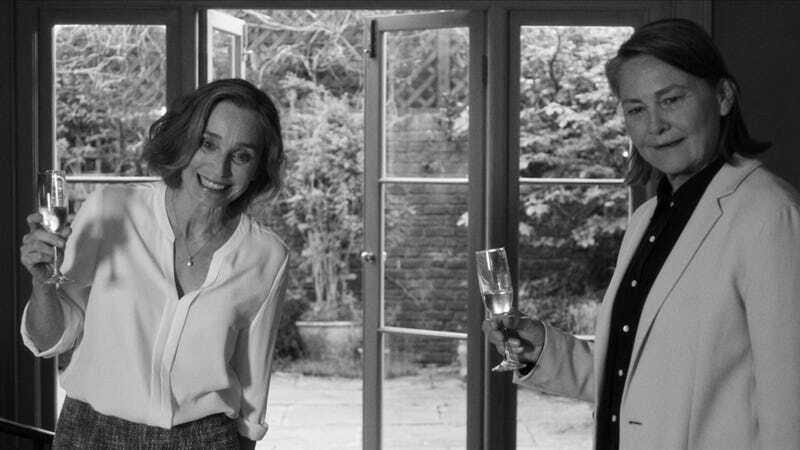 The very specialized world director Sally Potter (of Orlando fame) has created for The Party is, in some ways, fascinating: It’s a matriarchal society, where the women are all brilliant, witty, and powerful, and the men ineffectual at best. The shining star of this little community is Janet (Kristin Scott Thomas), who’s put together an intimate gathering of friends to celebrate her recent promotion to Shadow Minister for Health. First to arrive is her best friend April (Patricia Clarkson) and April’s adoring husband Gottfried (Bruno Ganz), a New Age “life coach” who, at first, seems horribly mismatched with his acid-tongued wife. Then there’s emotionally unavailable academic Martha (Cherry Jones), a professor specializing in “domestic labor, gender differentiation, and American utopianism,” as she smugly recites to a guest who challenges her academic prowess. 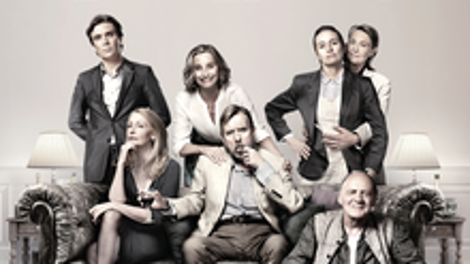 Martha’s wife Jinny (Emily Mortimer) just found out she’s pregnant with triplets, but that happy news is quickly derailed by Janet’s husband Bill (Timothy Spall), who breaks his near-comatose silence with a shocking announcement. And what’s going on with sweaty, coked-out Tom (Cillian Murphy)? On paper, this bourgeois nightmare reads livelier than it plays on the screen. Potter’s screenplay keeps throwing new twists at her characters throughout the film, each more pointed and darkly comedic than the last. But whether it’s because the emotional stakes are held down by the pretentious weight of the characters’ self-congratulatory intellectualism, or because of a disconnect between the performances and the words on the page, those barbs don’t always sting as much as they should. The effervescence of Clarkson’s performance in particular fades over the course of the film like a bottle of champagne left uncorked on the kitchen counter, and one scene of frantic fumbling that some directors would have played as absolutely manic retains a reserve that saps it of much of its comedic value. But even as individual moments fall flat, the film moves too quickly for any one of them to leave a particularly bitter aftertaste. Injecting some sparkle is Thomas as Janet, a driven politician with secrets of her own. Her breakdown (mostly internal, of course) over the course of the film has a dynamism that’s missing in her castmates’ sometimes shallow comedic performances, and adds depth to a story more concerned with high-minded ideas than human emotions. (It’s not a coincidence that the middle third of the film, in which Thomas slumps over a footstool and bemoans her fate, is also its least compelling section.) Clocking in only 71 minutes long, The Party is shorter than many of the “intellectual dinner party disaster” plays from which this overtly theatrical chamber piece draws clear inspiration (Yasmina Reza’s God Of Carnage, and its 2011 film adaptation, come immediately to mind). Nevertheless, whether it’ll make for a fun night out depends whether your tastes run more red wine and canapés or red bull and vodka.